We've changed our name! 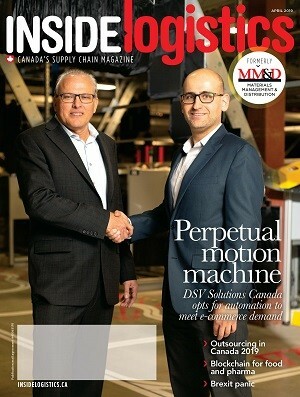 Introducing Inside Logistics - Canada's Supply Chain magazine. We’ve changed our name! Introducing Inside Logistics – Canada’s Supply Chain magazine. We are very pleased to be introducing this new brand as part of the Newcom Media Supply Chain Group. As the successor to MM&D magazine’s 63-year record of success, we aim to continue the tradition of great coverage of Canadian stories and newsmakers, along with global trends and influential new technologies. Inside Logistics is designed to welcome you inside the world of distribution logistics, from the point of view of distribution centre and warehouse operations. The name says it all – we are going to give you the insider’s view into these logistics operations. The name is also a nod to the growing popularity of the term intralogistics, which can be defined as: the art of optimizing, integrating, automating, and managing the logistical flow of information and material goods within the walls of a fulfillment or distribution centre. We still cover the type of information – from inventory control to order processing, material handling and storage to dock door scheduling and supply chain integration – you counted on from MM&D magazine. But these distribution functions have changed dramatically over the years and we’ve changed along with them. It’s time to reflect that with our new brand, so Welcome to Inside Logistics; we look forward to sharing the news, trends and experiences that are important to your life as a supply chain professional. Delon Rashid is our new director of business development. Delon joins Canada’s leading supply chain publications after more than a decade with Newcom’s publications serving Canada’s for-hire and private trucking industry. He will be responsible for sales development across the Canadian, US and international markets for Inside Logistics, Canadian Shipper and Solid Waste & Recycling as well as their digital and video properties. Rashid is based out of Newcom’s head office in Toronto. Derek Clouthier joins the Supply Chain Group of magazines as western editor. Based out of Calgary, Derek will report on supply chain events from Manitoba to British Columbia. An award-winning writer, Derek has over eight years of experience in journalism, with nearly three years covering the transportation industry. Anthony Buttino has been appointed regional account manager for Canadian Shipper and Inside Logistics in Quebec. Anthony has more than 20 years sales experience in the Canadian, US and international publishing industry. He is particularly experienced in leveraging his creativity to put together creative multi-media packages. Fluent in French, Anthony is based out of Newcom’s office in Montreal. Finally, Lou Smyrlis, who served as editorial director of Canadian Shipper from 2000 to 2013, returns to the supply chain fold as managing director of the supply chain group in charge of the sales, editorial and research teams. Inside Logistics also sincerely thanks Nick Krukowski for his years of leadership as publisher. Krukowski spearheaded significant adjustments to enhance the publication’s leadership and relevance to Canada’s supply chain professionals. His last project was launching the redesign and rebranding of MM&D to Inside Logistics. Krukowski will be missed but we wish him well in his new endeavors.